Your canoe! Finding canoes is always a challenge for Amici’s Canoe Heads for Kids. It would help us greatly if you brought your own! Extra points for your old camp gear! The Amici’s Canoe Heads for Kids route is 7.5km of portaging and 7.5 km of paddling along the Toronto waterfront. The portage begins at Harbourfront Canoe and Kayak Centre (283 Queens Quay West) and continues west along the Martin Goodman Trail to Sir Casimir Gzowski Park (1751 Lakeshore Blvd West). At Sir Casimir Gzowski Park, participants rest and have a bite to eat before commencing their paddle along the waterfront back to HCKC. The route is marked by volunteer route marshals who are there to cheer you on, mark the kilometres as you pass, and respond to any emergency situations - they've got your back! 12:30 pm - Welcome speeches! Whomp, whomp, all events gotta have 'em. Keep in mind number one is the most important! Participants should bring proper equipment and gear for weather and temperature. The Team Captain should organize his/her team so that there is one cell phone in each boat at all times. 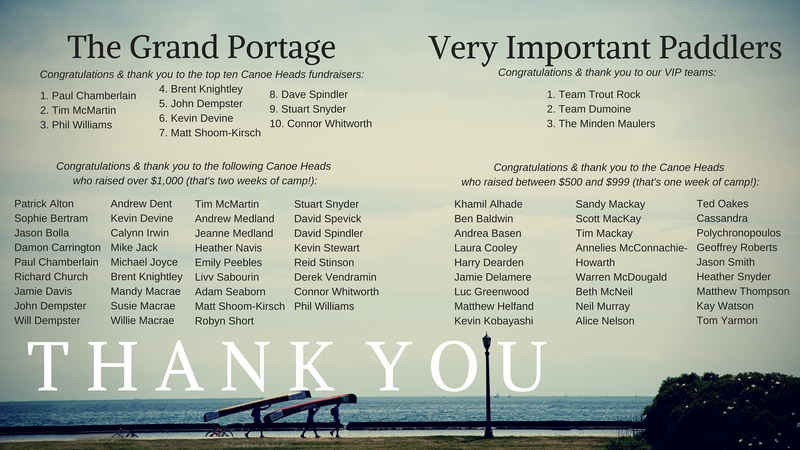 Because of the physical nature of the event, and the inherent risk of paddling on open water, it is expected that participants will not consume alcohol or non-prescription drugs during Amici’s Canoe Heads for Kids. Join us from 4:30 - 9:00 pm to celebrate an amazing day of portaging and paddling around downtown Toronto! This year's Canoes n' Brews After Party will take place at the Labatt Brew Pub, located at 207 Queens Quay W.